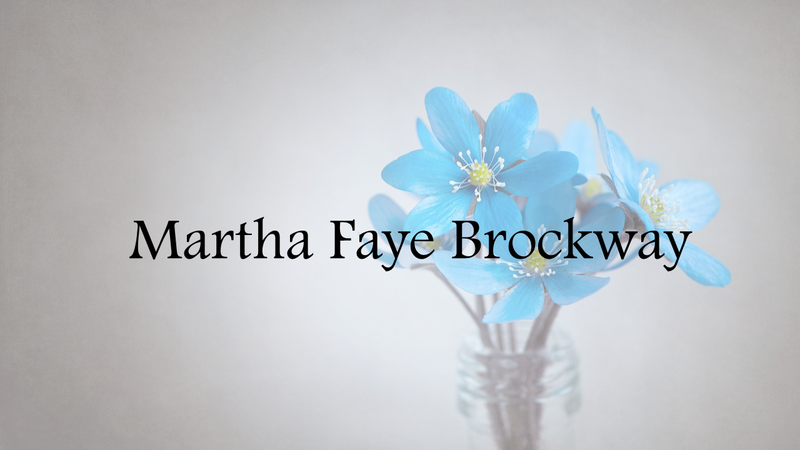 Martha Faye Brockway, 76, of Double Springs, entered into rest on Friday, March 22, 2019 at her home surrounded by her family. "Martha Faye" was born August 26, 1942 in Winston County. She was a 1960 graduate of Winston County High School, was a long time teller at Traders and Farmers Bank, and also worked for the Drummond Coal Company. Martha Faye had a generous heart and loved her rescue dogs. Visitation will be on Sunday, March 24, 2019 from noon until 2 p.m. at Nichols Funeral Home in Double Springs, where services will be held at 2 p.m. Brother Etsel Riddle and Brother James Hood will officiate. Burial will be at Mt. Ebron Cemetery, Double Springs. Martha Faye is survived by her husband of 54 years, LeRoy Brockway; sons, Jeff Brockway, Michael (Angela) Brockway, and David (Nancy) Brockway; brothers, Marlin "Sam" (Betty) Townsend, Edward "Ed" (Kay) Townsend, Jerry (Deborah) Townsend, and Tommy (Sonja) Townsend; sisters, Margie (Etsel) Riddle and Jan (Gordon "Bubba") Pigg; "Maw-Maw" to nine grandchildren, Elizabeth Brockway Cifuentes, Joseph Brockway, Allison Brockway, Jessica Bloom, Brooke Bloom, Megan Brockway, Lisa Brockway, Nathan Brockway, and Shannon Hunter; and four great-grandchildren, Braiden Brockway, Kylie Cifuentes, Ayden Kitchens, and Olivia Cifuentes. She was preceded in death by her parents, Elton and Ruby Townsend; step-mother, Velma Townsend; daughter, Connie Lisa Brockway; grandparents, Joe and Lucy Townsend and Benjamin and Gertrude Overton; and brother, Otis Edward Townsend. In lieu of flowers, the family requests donations be made to St. Jude's Children's Research Hospital, 501 St. Jude Place, Memphis, Tennessee 38105.